“The Tea Party acted like terrorists in threatening to blow up the economy,” said Vice President Joe Biden, according to Politico, during a two-hour meeting with angry House Democrats. In a CBS interview, the Vice President denied using the “terrorism word”. Kendra Barkoff, Biden’s spokesperson, added further clarification: “The word was used by several members of Congress. The vice president does not believe it’s an appropriate term in political discourse.” The closed-door caucus meeting took place amidst the scramble to pass a deal to raise the debt limit before the August 2nd deadline, a deal that some Democrats called a “Satan sandwich”. But how far off the mark are Paul O’Neil and the angry Democrats? Not that far. This is not the first time our government has been threatened by right-wing zealots, however. In the elections of 1994, Republicans took control of the House and Senate. 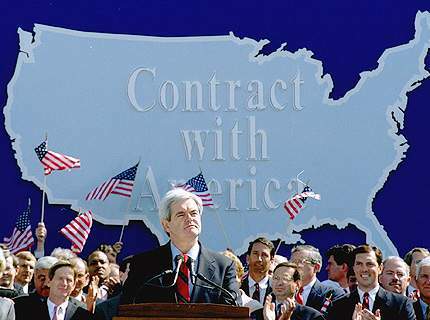 Led by Newt Gingrich and motivated by his “Contract with America”—or, as Democrats termed it, the Contract on America—right-wing ideologues in Congress sought to reshape the government by gutting programs, including Medicare and Medicaid, the Environmental Protection Agency, and programs for the poor, such as Head Start, food stamps, and the Earned Income Tax Credit. The Contract withAmerica also outlined an ambitious agenda, which included legislation for a balanced budget amendment and term limits. Gingrich, the new Speaker of the House, even threatened to not raise the debt ceiling. These right-wing freshmen were operating on two assumptions: (1) that the American people had provided them with an historic mandate to carry out their agenda and (2) that President Bill Clinton would cave in to their demands. After all, the American people just overwhelmingly swept the Republicans into power for the first time in over forty years. On the second point, they believed that President Clinton was politically weakened by scandals, which were manufactured by ultra-conservative Clinton-haters and fueled by a pliant media; they also believed that he was without convictions of any kind and lacked moral fortitude. By the end of 1995, they would be proved wrong on both fronts. At midnight, the government shut down began. Nearly 800,000 federal employees were furloughed and the lives of millions of Americans were inconvenienced. In order to prevent default, Secretary of the Treasury Robert Rubin borrowed $61 billion from retirement funds and employed some financial gimmicks, a move that elicited cries for his impeachment from Republicans who preferred that the country be thrown into default. Briefly, the government shut down ended, and it appeared that there would be a budget deal. But the Republican lead Congress continued to send the President bills that unnecessarily inflicted economic pain on the most vulnerable Americans. So, it was not to be, and the government was shut down for a second time. The American people were angry. The poll numbers for Republicans (and Gingrich in particular) plummeted, while the President’s poll numbers skyrocketed. In some polls, his numbers were almost 70% among likely voters over the age of 50. The American people rejected the extremism of the right-wing ideologues and supported President Clinton’s defense of programs that helped millions of Americans keep their heads above water. They rewarded him for not caving in to the demands of over-zealous Republicans, who were holding the American people and the economy hostage. In early January 1996, a contrite Gingrich apologized toClinton, saying, “We made a mistake. We thought you would cave.” On January 6, the government was back in business. It is difficult not to look back over the last year and see that President Obama has, time and time again, been rolled by House Republicans, lead by Speaker of the House John Boehner. He has caved in to the demands of the TEA-orists, who have threatened to wreak economic violence if their demands are not met. In the wake of the recent debt limit deal, Speaker Boehner has boasted that he got 98% of what he wanted. Emboldened, Senate Minority Leader Mitch McConnell hinted that his party would continue the tactics that have allowed them to cut spending and risk government default. “I think some of our members may have thought the default issue was a hostage you might take a chance at shooting. Most of us didn’t think that. What we did learn is this— it’s a hostage that’s worth ransoming.” The deal allows the debt ceiling to be raised until early 2013, but it cuts nearly a trillion dollars in discretionary spending over the next ten years and creates a bipartisan committee, which will be tasked with cutting an additional 1.5 trillion dollars. The TEA Partiers have thrown sanity into the wind. Though they brought the nation to the brink of economic devastation, many refused to vote for the deal that provided them with virtually everything they wanted and virtually nothing that the President wanted. These are people who will not take yes for an answer. Not everyone is thrilled about the deal. Obviously, Democrats are enraged. Some progressive groups, such as MoveOn.org and the Progressive Change Campaign Committee, are threatening to withhold support for the President’s 2012 campaign. Paul Krugman, a Nobel Prize winning economist, has described the debt deal as an economic “disaster”, warning that it will make our deficit problem worse and “takeAmericaa long way down the road to banana-republic status.” Lawrence Summers, a former economic advisor to President Obama, said that there is a “one in three chance” that there will be a double-dip recession. Standard & Poor, a major credit rating agency, has also responded to the debt deal by downgradingAmerica’s top credit rating. In a statement following the downgrade, S&P cited a dysfunctional political system and a failure to produce a credible, balanced plan. “The majority of Republicans in Congress,” a representative from S&P said, “continue to resist any measure that would raise revenues, a position we believe Congress reinforced by passing the act.” The American people, according to recent polls, also strongly dislike the deal. According to a CNN poll, 52% of Americans disapprove of the debt deal. The poll also found that three out of four Americans would describe elected officials as “spoiled children”. A New York Times/CBS News poll, for example, has Congress’s approval rating at a dismal 14%. Speaker Boehner’s disapproval rating is at 57%, ten points higher than the President’s. Public approval of the TEA Party is at a mere 20%. There are signs of hope for the White House in the polls, however. According to the latter poll, the American people trust President Obama over the Republicans with economic issues. They also blame Republicans for the crisis, believing that they refused to compromise. Despite all the drama, President Obama still stands with a 48% approval rating. At some point, President Obama is going to have to take a stand and draw a line in the sand. During the debt ceiling negotiations, he warned Rep. Eric Cantor: “Don’t call my bluff.” Yet, when they called his bluff, President Obama caved. In 1995, President Clinton demonstrated that he had conviction and moral fortitude. He held firm, risking his political career, and refused to be rolled by the right-wing zealots who were trying to gut government programs and remake the country in their image. When the dust settled, President Clinton not only succeeded in his 1996 election, but his fiscal discipline resulted in a balanced budget and a projected surplus in the trillions of dollars. Today, President Obama faces an equally fanatical and nihilistic group of TEA Party backed Republican freshmen who are willing to blow up the economy. Unfortunately, the TEA-orists have learned that they can get their way if they take hostages. This is a fundamental fight for the future of our country. President Obama needs to decide if he has the conviction to risk his poll numbers and his Presidency in order to preserve our way of life and win the future.